Indeed, the RN obtained two 78-foot Higgins PT boats from the USA, which were used as target towers. Originally these boats were assigned to Russia as part of the RPT-1 to RPT-12 batch. Initially RPT-1 to RPT-12 were ordered in August 1942 and awarded to Elco, <? :namespace prefix = st1 ns = "urn:schemas-microsoft-com:office:smarttags" />15 October 1942 (contract date: 12 December 1942). These boats were to be built as 80-foot Elco’s. However, RPT 1-12 were redesignated PT-372 to PT-383 on 21 November 1942 and were completed for the USN in August 1943. The second production batch of 78-foot Higgins boats, PT-85 to PT-94, PT-197 & PT-198, was substituted for the Elco's. 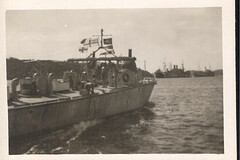 These boats, ordered 19 November 1941 (PT-85 to PT-94) and 25 March 1942 (PT-197 & PT-198) from Higgins Industries, were completed in December 1942. They were redesignated RPT-1 to RPT-12 and officially transferred to the Soviet Union under Lend-lease on 15 February 1943. Unfortunately for the Soviets, only two of the boats, RPT-2 and RPT-5, arrived in a Soviet harbor to become the Northern Fleet TKA-201 and -202, respectively. 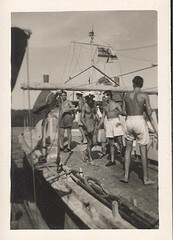 Two other boats, RPT-1 and RPT-3 were on board the Liberty ship SS Wade Hampton. This ship, a straggler of convoy HX-227, was torpedoed by the German U-405 (Korvetten-Kapitän Hopmann) on 28 February 1943 and sank on 1 March 1943. Apparently, also RPT-11 never made it to the Soviet Union. This boat was probably also lost while being transported on a cargo ship. 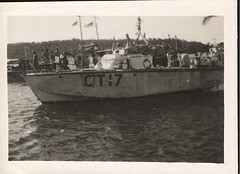 Because all convoys to Murmansk were cancelled in the Spring of 1943, the other RPT boats were landed in Great Britain. Seven RPT’s were incorporated in the Royal Navy in April 1943. Thus, RPT-4, -6,-7,-8 &-10 became MTB-419 through -423, respectively, and were shipped to the Mediterranean, while RPT-9 & RPT-12 became target towers CT-16 and CT-17. It is not clear at all to me why this happened. Were RPT-9 and RPT-12 damaged during shipment so that re-armament into MTBs was no longer feasible, or was there another reason? Also the fate of RPT-11 is a complete mystery to me. Finally, does anybody have access to information that could tell us on which cargo ships the RPT boats were transported to Britain and the USSR and in which convoys these ships sailed? 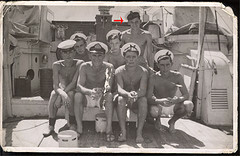 These are a few scans of my Father in Law Harold Phillips onboard CT-17 during 1944. 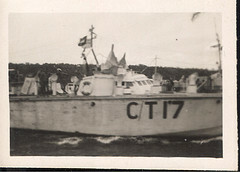 CT-17 was built by the US as a Higgins PT-198 in 23 January 1943 and transferred to Royal Navy in April 1943 as a Controlled Target Boat, basically a torpedo boat converted to target towing vessels, used, I think, for the RAF to practice firing at a high speed target at sea, it was returned in August 1946 and sold to Republic of the Philippines in 3 September 1946.